Can you believe summer is a little less than a month away-half a year gone already! Summer is my second favorite season; it’s hot, I grill way more than I usually do (yes, I’m one of those crazy people who BBQ year round. ), and even more gatherings with friends and family. It’s also when the DIY home decor projects kick into high gear (you know this is my favorite.) so I’ve got some free summer printables for you! My good friend came into town this past weekend and it was a great excuse to get a little fancy with meals and decorations (E says I go a little overboard and I do, but I can’t help it.)! For the occasion, I made a few printables and wanted to share them with you. I’ve added 3 printables to the library this month. There are 2 to frame and hang on your wall, add to your desk (which I did), and place on the table when we had out meals. The table tent cards also added some festivity to the table. To grab your printables, enter your name and email address in the boxes below the post. If you are already a member of the Back to the South Free Printables Library, login to grab yours! New home and organizing printables are added each month! Enjoy these summertime printables and here’s to a wonderful and safe summer! Great idea to give away printables, they are so popular right now. Yes they are Mandy and fun to make! Love these printables! Cant wait to print them and hang them in my home! These are fantastic printable! What a great idea! You are making my wheels turn. I love your creativity! You’re printables are so pretty! I like the top one best. Yeah! Printables make me so happy. Insta-decoration and happy happy! So glad to hear June! I love that you grill year round! My step-dad does the same thing, although we live in Utah so come January the temperatures may or may not be below freezing. These printables are so beautiful! Thank you for sharing :)! I love it! My husband always looked at me so funny when we lived in DC and I would grill in November or December. Yes, Gina. Summer is my favorite season. Thanks so much! These agree such cute printables!! What a fun summer idea!!! These are so fun! Love the creativity! Thanks, Jenna! I had fun making them. 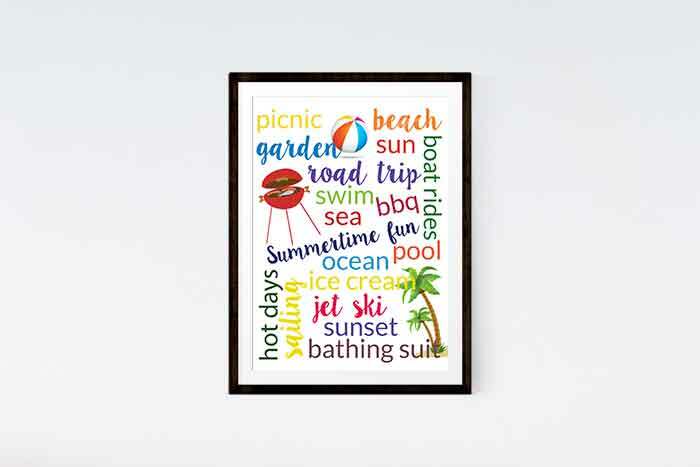 I love the bright colors on the summer printable. Thanks for sharing it free at the #HomeMattersParty this week. Thanks for stopping by, Rina. I just love summer-time for the beach!